Orlando Haddad brings a wealth of influences not only from his country of Brazil as a guitarist, vocalist, songwriter and arranger, but from his classical background as well. A native of Lavras, in the state of Minas Gerais, Orlando has been a bandleader since the age of 12. As a child growing up in Brazil he studied classical piano and guitar; later he moved to Rio de Janeiro, where he studied at the Villa-Lôbos Institute and pursued private classical guitar studies. In 1974 he came to the US to study music at the University of North Carolina School of the Arts, where he met Patricia, and graduated with a degree in Composition. He received a Masters of Science in Arts Administration from Drexel University in 1986, and in 2002 a Masters in Composition from Temple University, in Philadelphia. Orlando’s expertise in Brazilian music and rhythm has inspired invitations to teach courses, classes, and clinics at colleges and universities such as The University of Pennsylvania, Brown University, University of Maryland, University of Delaware, Franklin and Marshall College, Temple University, Dickinson College Swarthmore College, and The University of the Arts, where he taught for 10 years. In addition to the collection of songs written and recorded with Minas, Orlando has written various 20th Century-style works including 2 song cycles, a chamber music piece (Transparancies, performed by Rèlache), and 12-tone duets for oboe and viola. Orlando has written music for 3 documentaries and was commissioned to write arrangements for The Orpheus Club of Philadelphia, a choir of 80 men, and commissioned by Live Connections to write a suite to be presented by Minas and the baroque ensemble Melomanie. A native of Denver, Colorado, Patricia King grew up in Carlisle, PA, where she began her music education studying voice and piano, and composing at an early age. By the age of 6, she began performing and singing in musicals and theatrical productions. In 1974 she enrolled at University of North Carolina School of the Arts (UNCSA) where she studied opera and continued piano studies and composing, and met Orlando. Fluent in Portuguese, Patricia has journeyed to Brazil regularly for the past 30 years. She is a versatile and fluent pianist, a singer with a 4-octave range, and a prolific songwriter whose compositions are marked by a lyrical and sensuous style. Patricia holds a Master’s Degree in Jazz Piano Performance from Philadelphia’s University of the Arts and a degree in classical voice from UNCSA. She has taught music in The Philadelphia School District, and privately, as well as vocal coaching at The University of the Arts. Along with Orlando, Patricia has conducted clinics at The University of Pennsylvania, Brown University, University of Maryland, Franklin and Marshal College, Temple University, Dickinson College, Swarthmore College, and The University of the Arts, to name a few. 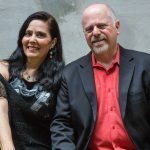 In addition to writing and recording for Minas, Patricia is currently writing a book and an opera titled “La Giara”, comprised of 25 pieces inspired by the story of her Sicilian family’s immigrationto America.